There are certain pieces of art from times long past that continue to fascinate. From the bust of Nefertiti and the Venus de Milo to the Dionysus Cup, such artefacts—whether seen in real life, in a book or on a website—have the power to grip the imagination and provide a connection with ancient cultures. It’s not just that these are often objects of rare beauty, it’s the human connection, that sense of awe invoked by looking at something made by human hands thousands of years ago. It’s not only the incredible workmanship, but the fact that these artefacts have survived to tell their very human stories. Recent discoveries in Spain have revealed that even our relations the Neanderthals were expressing themselves through art well over 60,000 years ago. Cave paintings discovered in Sulawesi, Indonesia dated at 35,000 years old and rock art from Arnhem Land in northern Australia dated at more than 40,000 years old depict animals including megafauna that died out long ago. Figurative art is very ancient indeed. As well as establishing an emotional connection between us and people long dead, ancient art reminds us of the very human desire to create things of beauty, a characteristic that has clearly been part of our makeup since the earliest times. But art also has an educative aspect. From ancient rock art, we’ve learned something about now-extinct flora and fauna, a little about what people ate, and where and how they lived and hunted. Ancient art is a window into a culture. Here are some other examples. The ancient Mesopotamian empire of Assyria has a rich and varied history, most of which we know about through art and literature that has survived in spite of massive political, economic and dynastic changes over centuries. Assyria was a thriving kingdom fostering literacy and the arts. One of the last great rulers, Ashurbanipal, famously had a well-stocked library in his palace at Nineveh; the books were cuneiform tablets, cuneiform being one of the earliest ever writing systems. His palace was also covered in art. The Lion Hunt of Ashurbanipal, a relief sculpture dating from around 640BCE, depicts the king getting the better of a lion. Just at one glance we can see that Ashurbanipal is both mighty and wealthy. Look at the detail in his costume. Scholars tell us only the king was permitted to kill lions, and other reliefs from the palace portray lions in various situations, wounded, dying, slain. Put aside our modern sensibilities and consider Ashurbanipal’s message. The art—beautiful and stylised—was intended to announce to the world that the king was a force to be reckoned with, a fearless warrior, someone who meant business. Assyrian art tends to be detailed and realistic, with incredibly close attention paid to landscapes and clothing, and there are many battle scenes depicting weaponry, horses and chariots and one-on-one combat. The art from that period confirms the militaristic bent of the kingdom and the glorification of its ruler. It’s incredible art with incredible stories and we can enjoy it as something striking to look at—see how meticulously the lion’s mane has been rendered—and as a starting point to finding out more about that ancient civilisation. That’s our homework sorted for the week. 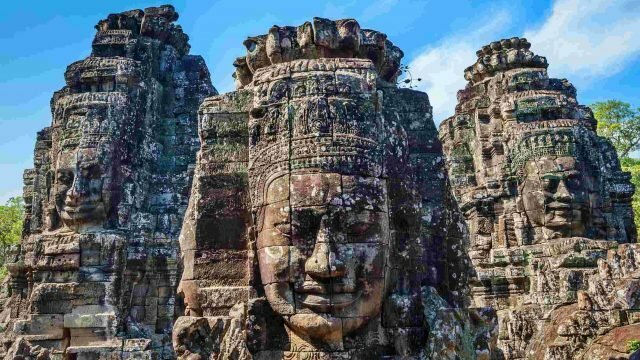 The archaeological site of Angkor in Cambodia is about 400 square kilometres, signifying its position as capital of the Khmer empire from the ninth to the fifteenth centuries. It’s home to a number of temples, the most famous of which is Angkor Wat built between 1112-1150CE. Dedicated to the Hindu god Vishnu, it was built by King Suryavarman II to validate his leadership and display his wealth and worthiness. It’s believed that around 300,000 men worked on the temple’s construction—architects, designers, stonemasons, labourers and sculptors. It’s the work of the sculptors that we’ll have a peek at. Thousands of reliefs adorn the walls. They show Hindu stories and also depict significant historical events in Cambodian history, mainly battles. We see soldiers grabbing their enemies’ hair, charioteers hurtling through masses of fighters, men wielding spears. The work is very detailed—clothing, headgear, weaponry are carved with precision and artistry. One relief shows Suryavarman attired in kingly garb being carried in a palanquin by his workers. He’s protected from the elements by large ornate umbrellas. Elsewhere at Angkor, there are sculptures of women cooking, children playing, market scenes, dances. From these, we gain a feel for the lives of ordinary Khmer people, the clothing, hairstyles, utensils, what they ate—all things with which we can identify no matter how many centuries have passed. Art once again becomes a window through which we can see the lives of kings, soldiers and ordinary people and learn something of the about the rich religious culture that informed their civilisation. When Mt Vesuvius erupted in 79CE, the towns of Pompeii and Herculaneum were covered in ash and lava and lay undisturbed until the eighteenth century. The famous fresco on the walls of what is now known as the Villa of the Mysteries was fortunately saved from obliteration. Written records about the ceremonies taking place in the fresco are scarce, but scholars have interpreted what is going on as part of a ritual preparing girls to become brides. Images of gods, priestesses, ceremonial objects such as laurel wreaths and drinking bowls and of course young women saturate the fresco showing the transition of girls from maidens to wives. It’s staggering to realise that these beautiful 2,000-year-old paintings have survived the ravages of time and natural disaster. The insights they provide into ancient life are instructive and intriguing, and no matter how much time has passed since the artist created these lively scenes, we are still able to identify with the humanity portrayed. This is one of the great powers of art. Art nurtures us, informs us, stimulates our imaginations. Art allows us to empathise with people from ancient and often intriguing civilisations, and also recognise that while time marches inexorably on, what makes us human remains constant.